MONTREAL – FRIDAY, AUGUST 3RD, 2012 – the soulful Canadian singer-flutist-songwriter Kimberley Beyea will be performing a passionate repertoire from her debut jazz album SEASONS at UPSTAIRS. 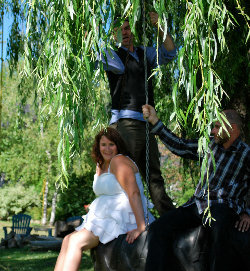 Blending traditional jazz with a modern twist, a sound that has a distinct Quebec edge, it’s perfect for summer weather! With her rich, powerful and gut-wrenching vocals, Kimberley expresses the passion in her soul through the lyrical themes of love and loss, joy and tragedy. Forever creating and looking to new experiences, this « old soul » unmasks vulnerability and the anguish through her voice and melody, touches listeners to the very core. Kimberley is proud to introduce two collaborators on this project —the talented and rhythmic musicians Barry Turner on guitar and Matthew Cabana on Upright Bass. Although SEASONS is her debut album, Kimberley is not new to the scene. As well as giving highlight performances at the Montreal Jazz Festival, she has been singing in and around Montreal for over 10 years. WHEN: Friday August 3rd @ 8:00 pm.